The first non-denominational churches appeared in the United States in the course of the 20th century, in the form of independent churches. It experienced significant and continuous growth in the 21st century, particularly in the United States, where they represented the third Christian denomination in 2010. In Asia, especially in Singapore and Malaysia, these churches are also more numerous, since the 1990s. The first characteristic is that non-denominational churches are not affiliated with a denominational stream of evangelical movements, either by choice from their foundation or because they have detached themselves from their Christian denomination of origin in their history. This doesn’t prevent them from being a member of a church union. Non-denominational churches are recognizable from the evangelical movement, even though they are autonomous and have no other formal labels. 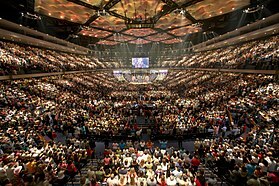 The movement is particularly visible in the megachurches. The neo-charismatic churches often use the term nondenominational to define themselves. Churches with a focus on seeker are more likely to identify themselves as non-denominational. Boston University religion scholar Stephen Prothero argues that nondenominationalism hides the fundamental theological and spiritual issues that initially drove the division of Christianity into denominations behind a veneer of "Christian unity". He argues that nondenominationalism encourages a descent of Christianity—and indeed, all religions—into comfortable "general moralism" rather than being a focus for facing the complexities of churchgoers' culture and spirituality. Prothero further argues that it also encourages ignorance of the Scriptures, lowering the overall religious literacy while increasing the potential for inter-religious misunderstandings and conflict. ^ Prothero, Stephen (2007). Religious Literacy: What Every American Needs to Know - and Doesn't. New York: HarperOne. ISBN 0-06-084670-4. This page was last edited on 5 April 2019, at 02:41 (UTC).